There's a new monthly lecture series called Master's of Social Gastronomy hosted by Sarah Lohman of Four Pounds Flour and Joanthan Soma founder of Brooklyn Brainery. 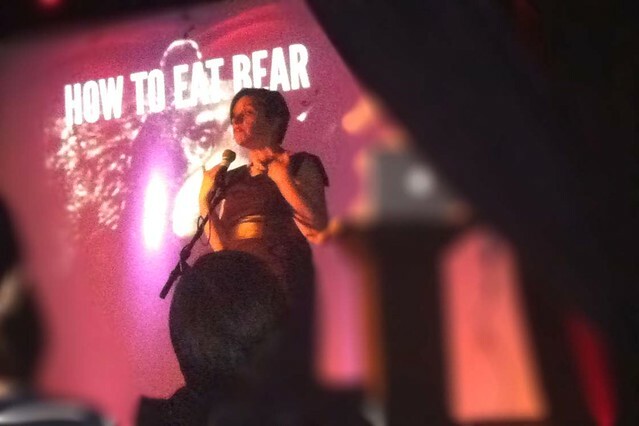 They held their first event this week at Public Assembly free of charge and served us BEAVER MEAT! Tasted a little like goat; I'd eat it again. I've taken a class with Sarah at Brooklyn Brainery before for historic cocktails and she consistently pulls through as a well spoken knowledgeable presenter. Her slideshow consisted of her adventure in cooking with bear, beaver, and moose mouffle (whoah). Click here to find out where to get your own game and recipes!